I thought there was 3: 1) all-AA, 2) AA/oneworld, and 3) AA/non-oneworld. Changing the type can normally incur a redeposit fee but my understanding is that AA has a policy to waive the fee when converting from #1 to #2 (or vice-versa), which seem to be the case here. 2 types, not 3 (common misconception here as some members insist it's 3-- it isn't) and I agree that this isn't an award-type change. its' Oneworld/other airline award -> Oneworld/other airline award (no change), was never an all AA award. But, not sure the above policy fits-- at least not exactly for this change. Worth another inquiry, of course. Ah, yes on closer inspection it's not even an award type change and even if the aagent can imagine a way a fee applies (as was apparently the case here) then there'd be the waiver to counter their BS. I think we've all learned that the answer phone agents give as to the "why?" a charge/redeposit/etc applies in such a case is correct about 15% of the time or so. So, it's always a question of asking again, trying to determine the -real- reason (usually done here) and seeing if that reason definitely applies or if it's at all a gray area, and, can often involve quoting one of the policies right to them and asking them to check it out in light of same. I want to go from London to India. Can I use Qatar Airways or Etihad Airways to connect in Doha or Abu Dhabi? 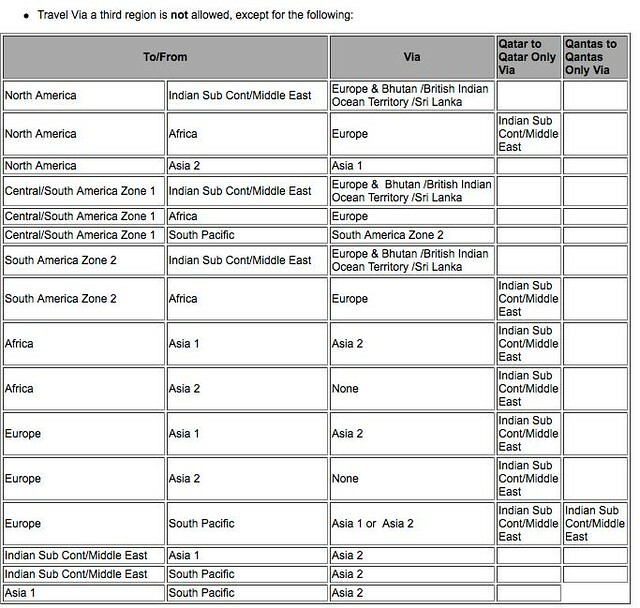 I noticed that AA have recently split the Indian Sub Continent/Middle East into 2 regions now. Yes. You can also use Sri Lankan, Jet Airways, and Gulf Air -- if need be. Does it need to be QR-QR connection? I don't believe so, as long as the governing carrier has a published through-fare from origin to destination that permits the particular routing -- and mix of carriers. Just had an agent tell me it would be $150 to change BOS-HKG to BOS-JFK-HKG because it involves "increasing the number of carriers." Is that a rule? I've gone from 2 to 3 carriers before without issue. BOS-JFK-HKG is AA/CX, BOS-HKG is CX. Ticket was originally BOS-ORD-HKG. Thanks all! As suggested, I called again and got a much more helpful agent. "Ok, so you have BOS-JFK-HKG, but you want to switch to a nonstop the following day?" "Sir, that's the routing you have. But it says a request was put in for the BOS-HKG nonstop, but unfortunately the seats were not available so it came back." So I went online and checked, and indeed, that's what was ticketed - because the previous operator said it would require a fee, and because I definitely did not pay a fee, I assumed that my ticket remained unchanged. So, anyway, I got the change with no fee. To the poster above who asked about the "most direct routing rule": Quite right, but since I was changing dates, and since the BOS-JFK-HKG was the most direct routing on the new dates - and only routing, unless I wanted to do BOS-LGA-JFK-HKG, which I *do not* - so it wasn't an issue. Would this price out as one or two awards? FWIW: there are no DOH to IAD/PHL flights during the window. Also, would EBB > DOH > LHR > IAD price out as one or two awards? Each routing should price as two awards. in J using 70k miles for this December on Etihad. It was my understanding that since the middle east and india are now 2 separate regions this should've priced at 100k, 70k US-Middle East, 30k Middle East to India. 70k was how it priced by default in my case. Thought this data point might be helpful for others interested in similar itineraries.